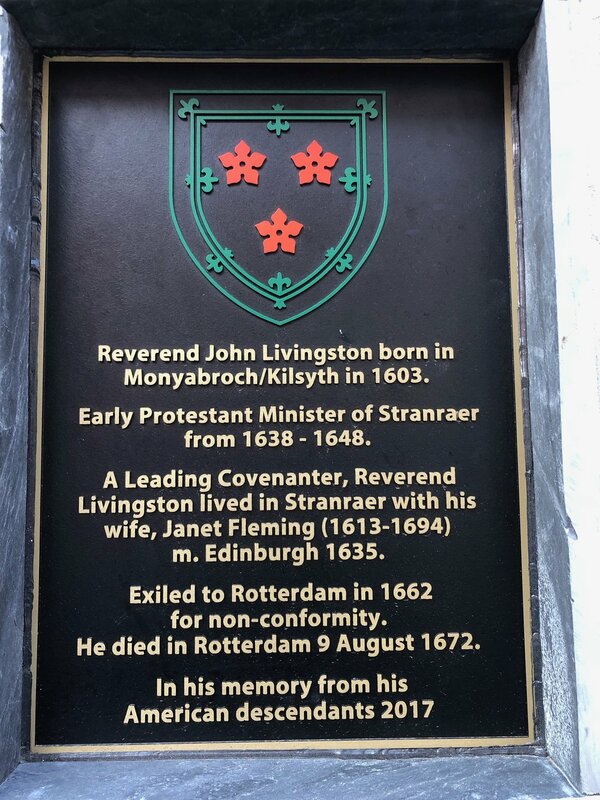 Last month a new plaque was unveiled marking the ministry of the Covenanter John Livingstone in Stranraer from 1638-48. Livingstone himself recounts how in 1638 he received calls from both ‘Stranrawer in Galloway’ and Straiton in Carrick. He would have chosen Straiton, but sought the advice of six ministers (Robert Blair, David Dickson, Andrew Cant, Alexander Henderson, Samuel Rutherford and his own father) who advised him to choose Stranraer, because it was within four miles of Portpatrick ‘and so nearer for the advantage of our people in Ireland’. 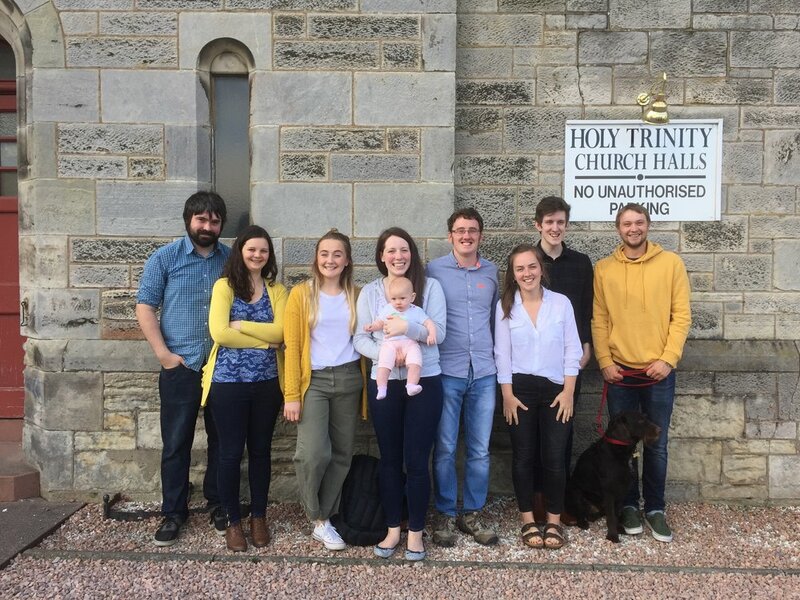 He recounts the 3-day boat journey from Irvine to Stranraer, including a whole day without food or water, concluding ‘yet it pleased the Lord we came safe to Lochryen’. And in words quoted in the newspaper report above, he writes: ‘Some of our friends out of Ireland came and dwelt at Stranraer, and at our communions twice in the year great numbers used to come; at one time 500 persons; and at one time I baptized towards twenty-eight children brought out of Ireland’. (republished by Banner of Truth in 2008 as Scottish Puritans). 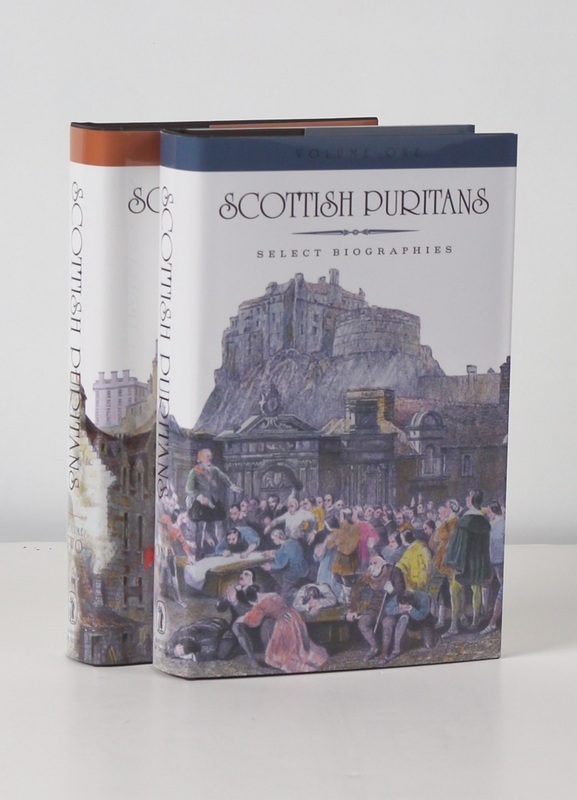 We have previously made available the contemporary account of his preaching mentioned in the talk, and the entry on Symington in the Dictionary of Scottish Church History and Theology. Yesterday, just three days after Stephen’s talk, Roy Blackwood (whose PhD thesis on Symington is invaluable) passed away. You can read a tribute to him on the Gentle Reformation website. 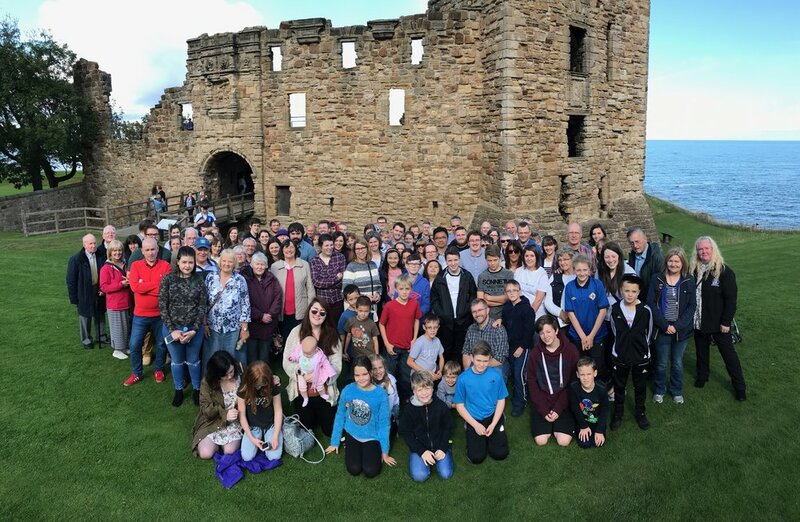 On Saturday, we joined with over 100 others from the RP churches of Glasgow, North Edinburgh and Airdrie (and friends from elsewhere) on a Reformation day trip to St Andrews to mark the 500th anniversary of the Reformation. With heavy rain the day before and the day after, we were grateful to God for a dry and sunny day for the trip. We arrived in St Andrews in time for lunch, before heading out to tour the town and hear talks on three famous Reformers who are associated with it. 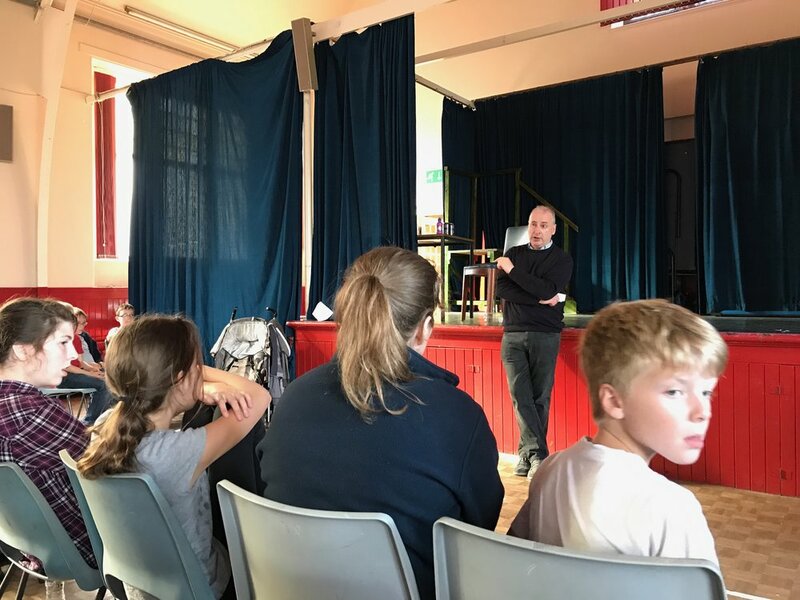 The first talk was given by Jimmy Fisher of Reformation Tours. He spoke about Patrick Hamilton, who first heard of the teachings of Martin Luther when at university in Paris. After returning home to teach at the University of St Andrews, he became convinced that Luther's teachings were Biblical. He began to preach and saw many people converted before being arrested, tried and burnt at the stake in 1528. However rather than stopping the progress of the Reformation, his death helped spread it. We then moved from St Salvator's to the Castle where Stephen spoke about George Wishart, whose theological ability and preaching around Scotland gave the Reformation both depth and breadth. Wishart too was martyred in St Andrews, being hanged and burnt outside the Castle in 1546. 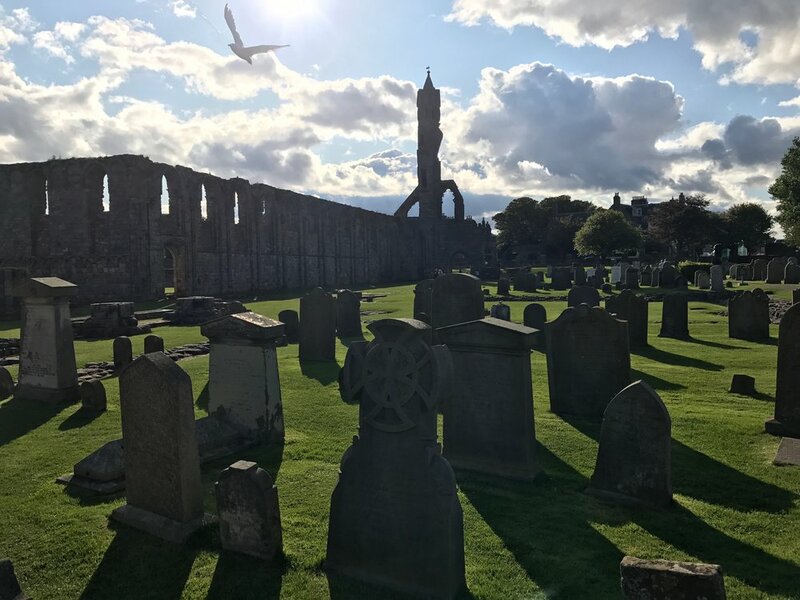 The final spot we visited was St Andrews' Cathedral where Peter Loughridge (North Edinburgh RP Church) spoke on the most famous Reformer of all - John Knox. Knox has many critics but Peter showed how he was just the man who God had shaped for such a time. Knox, like the other Reformers spent time abroad and had many contacts outside Scotland. Being part of this wider network benefitted the work of the gospel in their homeland. While at the Cathedral, we had the opportunity to visit the grave of Samuel Rutherford, someone who would be greatly used by God the century after Hamilton, Wishart and Knox. We then returned to our our starting point where Kenneth Stewart of Glasgow RPC gave a short talk on the benefits of the Reformation for Scotland. Overall it was a great day and we are thankful to God for safety in travel, fellowship, and the opportunity to learn more about the great heritage that Scotland has.